Developed by DynArt Games, Digger Ant is a freeware PC game inspired by the timeless classic and that has seen many updates, both free and retail. The core of the game remains and that’s the most important, since that is where the fun of the gameplay is. 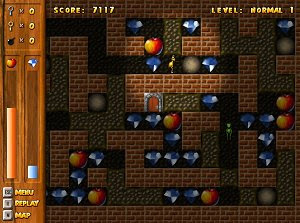 The player has to dig the ground and collect all the gems. Our ant is resourceful and may use keys and bombs, among other options.